The October IMGA e-news has been sent out to members. It can be downloaded from the member site. The IMGA meeting presentation by Nelly Mañay and Carla Patinha at the ISEH 2016, ISEG 2016 & Geoinformatics 2016 conference in Galway, Ireland is available. It can be downloaded from the member site. All members are invited to attend! Active IMGA members will have access to this webinar by accepting the invitation sent by Maria Armienta from Anymeeting. 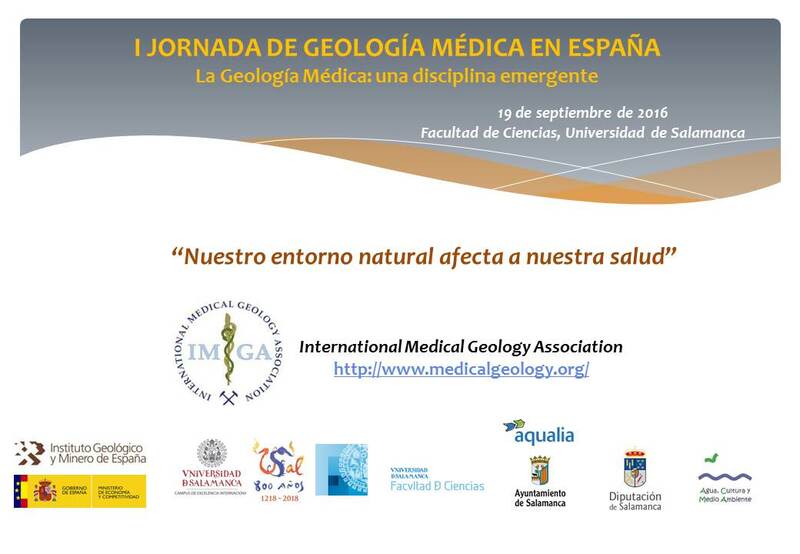 I Workshop on Medical Geology in Spain: "Medical Geology: an emerging discipline"
The Spanish Chapter of IMGA, in collaboration with the Spanish Geological Survey (Instituto Geológico y Minero de España, IGME) and University of Salamanca, organize the first workshop on Medical Geology in Spain, with the title "Medical Geology, an emerging discipline." Registration is free. To register write an email to IMGA-Spain@hotmail.com indicating full name and affiliation. The event announcement is available online . El capítulo español de la IMGA, en colaboración con el Instituto Geológico y Minero de España (IGME), y la Universidad de Salamanca organizan la primera jornada de Geología Médica en España, bajo el título 'La Geología Médica, una disciplina emergente'. La inscripción es gratuita. Para formalizar la inscripción escribir un correo electrónico a IMGA-Spain@hotmail.comindicando nombre completo y afiliación. El anuncio del evento está disponible online . All IMGA members attending the conference are invited to attend the IMGA Business Meeting on Wednesday, August 17 at 13:30. The meeting will be held in the Geography Seminar Room (Room 113) of the Arts/Science Building on NUI campus. The map link above shows the Arts/Science Building location relative to other venue locations. The new issue of the U.S. Geological Survey's Environmental Health Newsletter is now available online at https://www2.usgs.gov/envirohealth/geohealth/v13_n01.html. The Royal Society of Chemistry (Pakistan) and The Environ Monitor (Leading Environmental Journal of Pakistan) are raising environmental awareness and providing industry, academic, and government professionals with state-of-the-art know-how about natural resources, chemistry and environment. The National Conference on Climate is Changing: Food and Agriculture Must Too will be held at the Ambassador Hotel Lahore on World Food Day 2016 (October 15, 2016). Download the information flyer to learn more. Abstracts are currently being accepted for the 3rd Asian Clay Conference to be held November 18-20, 2016 in Guangzhou, China. Sessions of particular interest include "Clays, nanoparticles and health" and "Clay and micro-organisms." The deadline for abstract submission is September 30, 2016. Some Chapter reports (Mexico,Russia/NIS, and Uruguay) did not make the last Medical Geology Newsletter. These reports are available on their respective Chapter pages. Congratulations to the Russia-NIS Chapter! The MedGeo2017 conference website is up and ready to go athttp://www.medgeo2017.org. Royal Society of Chemistry (Pakistan Section), The Environ Monitor, National Foundation for Environmental Education & Research, and IMGA (Pakistan Chapter) held a one-day "National Conference on Water for People, Water by People" in Lahore in connection with World Water Day 2016. The report is available here. 6-month reports for Local Chapters (Brazil, Colombia, Nigeria, Sweden, UK) are available on their respective pages. Medical Geology Newsletter 27 is now available in the member section. There's still time to submit your abstract (by May 9) for the 2nd European Mineralogical Conference to be held September 11-15 in Rimini, Italy. Theme 14 of the conference is "Environmental and Medical Mineralogy": http://emc2016.socminpet.it/programme/themes/107-themes/133-theme-14-environmental-and-medical-mineralogy.html. A reprint of the 2014 Geosciences special issue is now available for download as a 258-page PDF at http://www.mdpi.com/books/pdfview/book/182. The abstract deadline has been extended to March 31 for ISEH 2016 and ISEG 2016 and March 20 for Geoinformatics 2016! The joint international conference of ISEH 2016 (The 3rd International Symposium on Environment and Health), ISEG 2016(The 10th International Symposium on Environmental Geochemistry) and Geoinformatics 2016 (The 24th International Conference on Geoinformatics) provides an historic opportunity for international experts working in the closely related areas of environment, health, GIS, and agriculture to meet and share the latest understanding of the ever growing challenges between Homo sapiens and our changing environment. The joint conference will be held on the campus of NUI in Galway, Ireland, August 14-20, 2016. The February IMGA e-news has been sent out to members. It can also be downloaded from the member site. ISEG 2016 (The 10th International Symposium on Environmental Geochemistry) will be held as a Joint International Conference with ISEH 2016 (The 3rd International Symposium on Environment and Health) and Geoinformatics 2016 (The 24th International Conference on Geoinformatics) in Galway, Ireland, August 14 - 20, 2016. Read more about the NSF-supported research at http://www.nsf.gov/discoveries/disc_summ.jsp?cntn_id=137239&WT.mc_id=USNSF_51&WT.mc_ev=click. We thank counsilor Ester Sztein for sending this information.